← First Day of Fifth Grade! Finally! Time to Rest and Reflect…. But by day 5, things are starting to settle down (at least a teeny bit), so I can stop to rest and reflect on how the first week (and then a day today) have gone. And I’m happy to report that things have gone pretty well. So far so good! 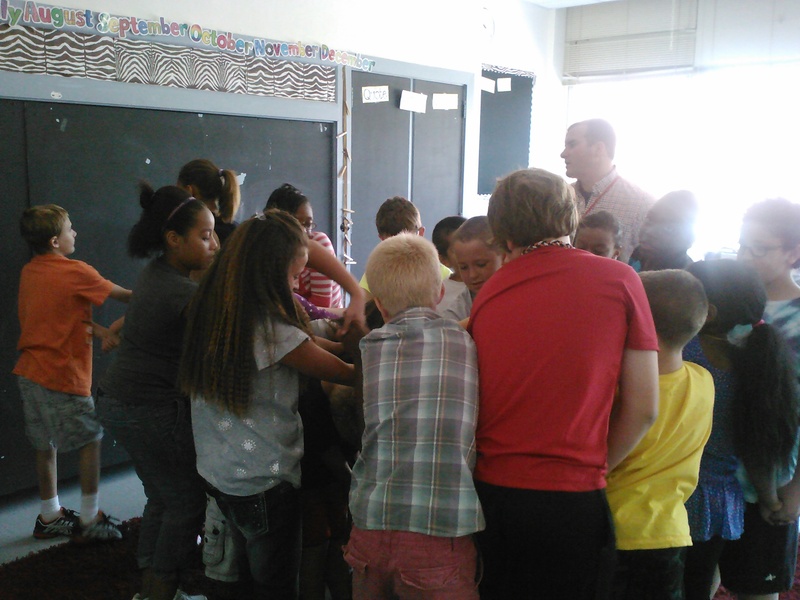 One of the team building activities on our list was the Human Knot. Basically, you “tie” yourselves together by holding hands across the circle, then you have to work together to “untie” yourselves into one big circle at the end. We did this very early on, very shortly after we had all met each other, thinking (and hoping really!) that it would be hard. We did pretty good for our first try, actually, and got two parts of the knot undone. There was a pretty large tangle still left in the middle, though, that was ready to topple over at any moment. We celebrated the way we worked together and let certain friends step up and lead, and vowed to do better next time. I’m so excited to try this again after we’ve done some more community building, because I know they will do even better! I found an activity on Twitter the other day, posted by another #5thchat teacher, that I thought would be a great partner thing to try–Saving Sammy! The basic idea is that you have to get a gummy worm (Sammy) into a gummy life saver (his life preserver) so that he doesn’t drown. The only catch is that you can’t use your hands! Instead you have two paperclips as tools. I added in a step at the end for partnerships to write about how they figured out what to do and any advice they had for kiddos trying for the first time. This went pretty well, and they definitely enjoyed it! Even as recently today, we have had some FABULOUS conversations about grit, played Appleletters, done something called 3 Things and 3 Friends, and almost completed some rather involved work with multiple intelligences. I hope to update you on those happenings soon! Please come back soon to visit again and catch up on the great things going on in Rm. 202! Posted on August 26, 2013 by Jen Bearden	• This entry was posted in Classroom and tagged community, first days, friends, human knot, saving sammy, snacks. Bookmark the permalink.